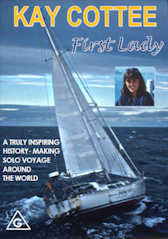 Kay's books and DVD with actual footage from her voyage are available here. There are also links to articles, blogs and wikipedia on this page. 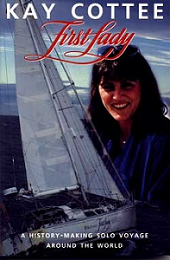 Published by Macmillan in 1989 detailing her experiences during her solo circumnavigation. 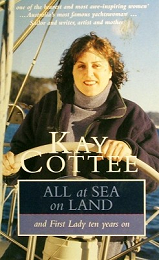 Published by Collins in 1998, details her life in the ten years after the voyage. DVD with incredible footage from Kays Voyage taken with the 16mm windup movie camera. Kay has a wikipedia article that is up-to-date and provides a brief overview of her life and achievements.